True to the very helpful form of YA books lately, we’re given a glimpse (albeit a brief one) into The Selection via Maxon’s POV. It’s nice to see it for a change, and it gives you a better sense of who he is. Since you’re all probably pretty familiar with Maxon, America and the other girls in the group, what we get here that’s not so familiar is a little bit of the back story on Maxon and where his apprehensions come from. The story opens up on Maxon’s 19th birthday, when he’s deemed old enough to select a wife, and there’s a party being thrown in his honor. If that wasn’t pressure enough, he has to engage in a bit of small talk with his father who truly believes that Maxon is incapable of doing anything that’s worthy of recognition and takes every opportunity that he can to belittle him. Through this conversation, Maxon actually learns that the lottery that the Selection is based off of isn’t that at all, and to his dismay, the girls are all selected by his father for what the women can do for Illea. (all except 3 girls who are 5s because their provinces didn’t have anyone of higher caste worth including, and this adds to the diversity of the competition – or so his father the king says). This is an interesting fact because where we were under the impression in The Selection that it wasn’t 100% a fair lottery (given that there were photos included and all that) but there was no chance of randomness at all. America’s inclusion was partly intentional, yet not as fully intended as the other girls. So, this story takes us through the days leading up to the arrival of the girls and then through that first day when Maxon meets all 35 and learns of the trade that America is willing to make. I can’t wait for a few more days to see whether he continues his plight with America or if we see what he felt with Celeste grow, especially since we know that he was so willing to stick up for her against America’s argument in The Selection. On to Tuesday – we’ll know more then! 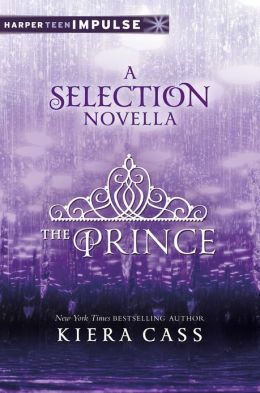 This entry was posted in Dystopian, Reviews, Young Adult and tagged Kiera Cass, The Elite, The Prince, The Selection by iscm13. Bookmark the permalink.